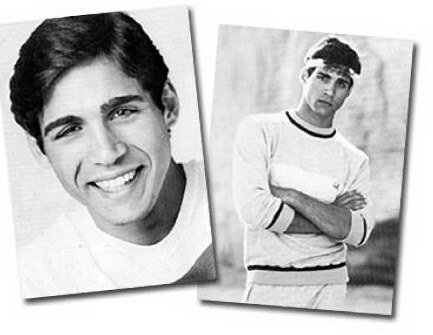 Photos courtesy of "Images of a Young Adrian Paul"
Please enjoy what we have researched and put together for your enjoyment!! 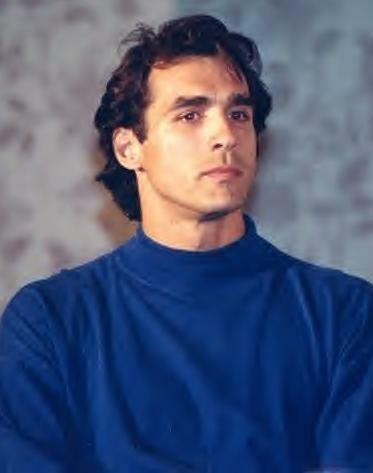 Born and raised in London, England, Adrian Paul boasts a colorful background. Adrian's mother was Italian and his father British. 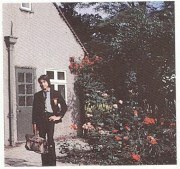 Around age 10 he attended a Rugby school, and tried out for the Wimbledon team when he was around sixteen. 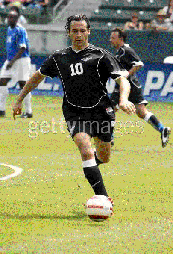 He played semi-pro soccer for Bromley Town and Beckenham Town teams too. In 1979 his current girlfriend submitted a photo of him for a contest, and he won! He began some modeling, then as a dancer and choreographer he traveled with a small dance troupe across Europe. His jazz ballet background helped! Adrian is a world traveler and speaks English, French, and Italian fluently as well as several other languages. 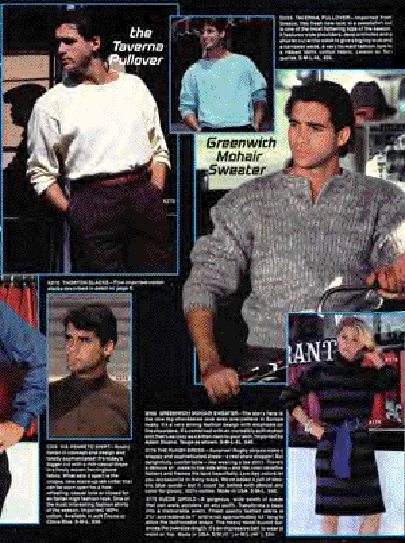 In 1985, he left Europe and came to the United States to pursue a dance and modeling career. Even though he had studied Shakespeare and performed in school plays when he was younger, acting was not a focus. He signed with the Ford Modeling Agency in New York. Waiting tables in restaurants and bars, he was down to $12 in his pocket when his big break came. His television first role came on the ABC television series, "The Colbys"
as the Russian expatriate ballet dancer, Kolya in 1986/87. Adrian only appeared in the 2nd Season. Filmography Pages for more details and pictures. Check out our COLBYS Screencaps page!! 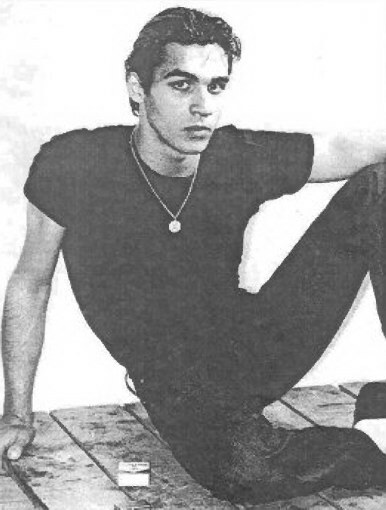 Appearances in "The Break" (playing Paul) and "Loyalties" (as Lorenzo) at the Bromley Theater Playhouse gave Adrian his love of theater. 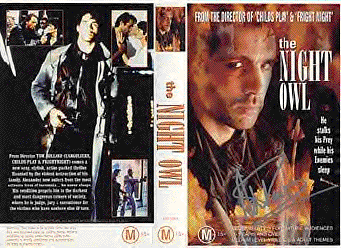 This led him to a role in the off- Broadway play "Bouncers" in 1987 at the Minetta Lane Theater. 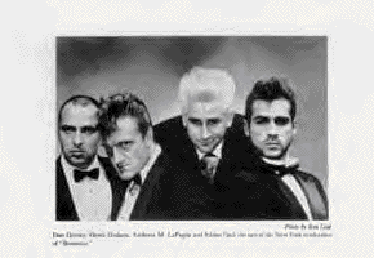 Early television appearances include: "Beauty and the Beast" in 1988. His first film appearance was in the 1989 film "Last Rites"
In 1988 Adrian starred in the Roger Corman film, "Masque of the Red Death," a retelling of the Edgar Allen Poe tale. 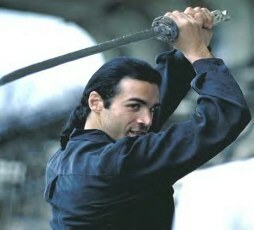 prominence to date...that of Duncan MacLeod in the syndicated series, "Highlander." to a gay Naval Captain. He seems to enjoy playing "odd" characters, ones that spur growth in his stable of repertoire. He has been involved in several Indie (independent) movies. Some roles Adrian has been considered for include that of Caledon 'Cal' Hockley in 1997's huge hit "Titanic," the role that went finally to Billy Zane, and Adrian's name has been bandied about many, mnay times for the role of James Bond, "007." A role in "Lord of the Rings" was discussed and Adrian himself has mentioned that he'd be interested in a role in 'Game of Thrones (2011- ). We fans eagerly await each and every one, no matter what the movie. Each movie is a new character, a new face, a new adventure! 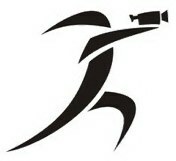 films with pictures, synopsis and links. Adrian has always loved animals. 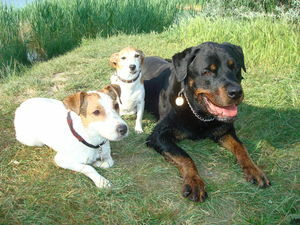 Check out BUDINO's own web page on Dogster. 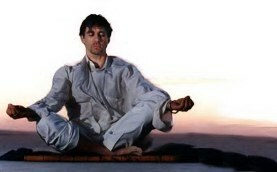 Adrian has studied various Martial Arts forms for many years, beginning about 1988. 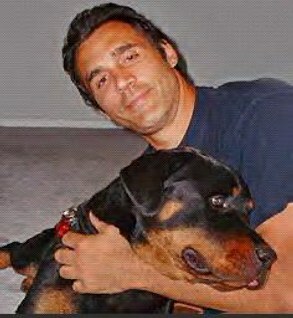 As of 2006 he had studied with Vernon Rieta for at least 14 years. With his "Sensei" (master teacher) Adrian has studied the Kung Fu artform Hung Gar extensively. 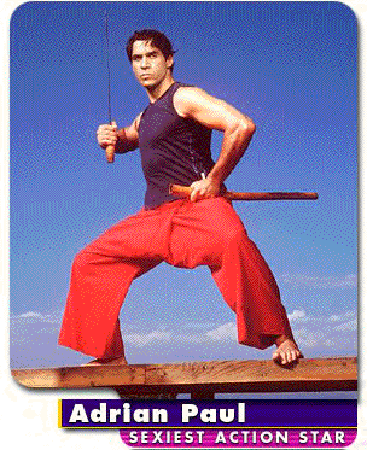 In addition, Adrian has dabbled in Aikido, Tae-Kwon-Do, Qi Gong, Karate, and boxing. He admits playing with the styles of Saam ying kuen and Choy Lee Fut. He currently has been dabbling in Tai Chi and at the HLWW9 event (LA, 2009) he taught several classes to the fans. With each movie, play or tv role that requires a physical fight scene, Adrian intensely studies and choreographs with whoever his co-star might be, gaining even more knowledge and experience. Adrian is still a soccer fan and plays local soccer when able. He is also an avid Poker player and enters Celebrity CharityTournaments regularly. Squash, Tennis, Soccer, Jet Skiing, Water Skiing, Snow Skiing, Martial Arts, Motorcycle Skills, Horseback Riding. Shaqtacualar event (children's charities) which Adrian participated in several times. charitable foundation known as PEACE. The letters stand for....... 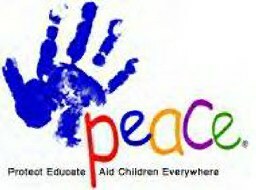 Protect Educate Aid Children Everywhere. Adrian's charity has donated to the Tsunami Relief funds as well as COTA (Childrens Organ Transplant Association) and he also has asked his fans to become part of the fund raising efforts for PEACE with charity auctions, theme days, and working with large department stores across the US. 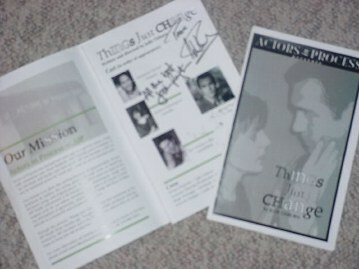 In April 2005 Adrian produced and starred in their stage production of Things Just Change. Adrian, along with fellow castmates Jessica Pennington, Juri Henley-Cohn and Marianne Ferrari performed on stage at the Odyssey Theater (in Los Angeles) in a play written by Julie Osburn. Read our write-up of the evening and see some pics of those who attended (sadly, no pics or filming was allowed during the play)....Click HERE! 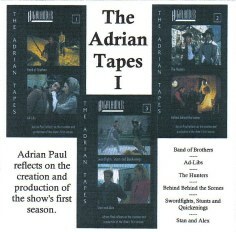 Visit AdrianPaul.net and find two (2) Quicktime videos from the play. Angelisa Valentina Rose. On July 16th, 2012 the now married couple welcomed a son, Royce Paul. Adrian joined forces and created his own production company, Filmblips. 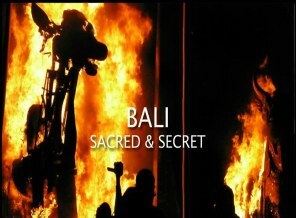 Several films are in the works....check our OUR Production page or visit Filmblips directly. Check out OUR Productions page for some info on Adrian's work. 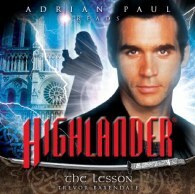 In the 90's Adrian recorded several tapes of his experiences, thoughts and creative ideas about Highlander. Since then, Adrian has continued to delve into the world of VoiceOvers. Check out our AUDIO Page for a complete listing and tons of information. Currently Adrian (eff. Dec 2012) has a talk show on LA Radio called "Peace Fund Radio." 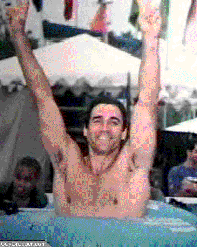 Please visit our extensive and detailed pages for ALL the Adrian Paul information you know you want!! **Disclaimer: Every attempt was made to obtain permission for use of pictures and graphics. This site is intended as entertainment only.